A Grade II-listed hall that influenced Charlotte Bronte's Jane Eyre has been put up for rent - for less than some London flats. North Lees Hall, near Hathersage, Derbyshire, inspired Thornfield Hall in the celebrated novel. The Peak District National Park Authority said it expects to charge about £1,200 per month for the three-bedroom property. It appears to be the second time the property has been listed this year. Thornfield Hall was the home of the 1847 novel's hero Edward Rochester. 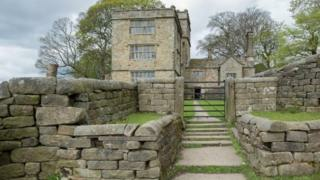 Its real-life counterpart is said to have been visited by Charlotte Bronte several times while staying with a friend. North Lees Hall is, according to an estate agent's blurb, "situated in spectacular countryside" with "stunning historic features of the Elizabethan era". It has three double bedrooms, two living rooms, and, true to its historic character, also boasts oil-powered central heating. By comparison, the average rental for a three-bedroom house in Bexley, south-east London, is £1,548 per month. It was opened up to the public last year to coincide with the 200th anniversary of the author's birth. The building was taken over by the Peak District National Park Authority after the Vivat Trust, which had managed it since 1988, stopped trading in July 2015. What could you rent for under £1,200? Emma Stone, from the authority, said: "This is a unique opportunity for someone to live in a beautiful property with huge historical significance. "It really is a one-of-a-kind with its own quirks and features - living there you could easily imagine you are Mr Rochester and Jane Eyre."